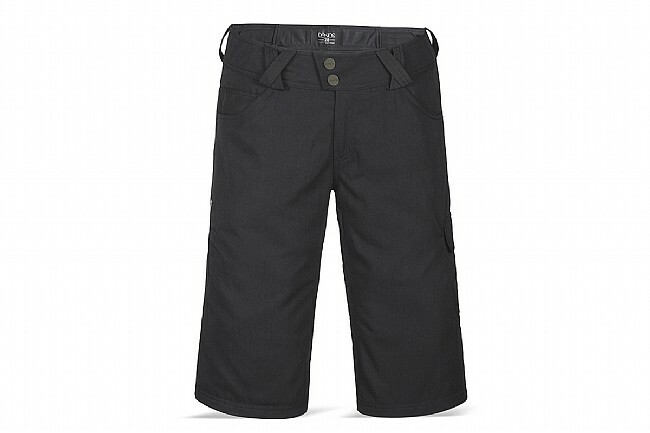 It's safe to say that the “Mode” in the Dakine Women's Mode Short is short for “Beast Mode” as these are some seriously burly bottoms ready to tackle your biggest sends. The Black option is made from 165 g polyester canvas and the Harbor blue from 165 g Nylon twill, both with a DWR coating to ward off showers and mud bogs. The cut is designed to fit over knee pads, and there's an elastic loop for a lift pass in the left front pocket. A mesh lining with zippered inner leg vents provides superior breathability, and interior waist adjustments plus a stretch rear panel ensure the perfect fit. Storage is definitely ample with front hand pockets with separate key pouch, a zippered rear pocket, and an additional zippered pocket on the right thigh. 14.5” inseam. Available in multiple colors.